The company delivered a better-than-expected earnings report toward the end of March that sent the shares higher. 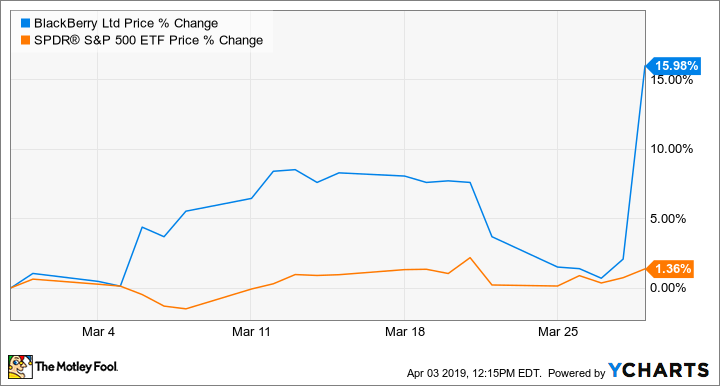 Investors were encouraged by BlackBerry’s performance on the bottom line that saw non-GAAP earnings per share more than double to $0.11 over the year-ago quarter. Revenue in the fourth quarter increased by 8% to $257 million, driven by strong growth from software and services of 16% year over year. The quarter marked a turning point in the company’s transformation, as software and services revenue growth offset the decline in the legacy handset business. BlackBerry completed the acquisition of Cylance, a security technology business that boosts the company’s position in enterprise services. In particular, it gives BlackBerry greater capabilities in artificial intelligence and machine learning for its cybersecurity business. With growth from software and services now driving the company’s top-line growth, the future looks bright. BlackBerry is well positioned for growth in enterprise, as noted by the recent deal to provide secure voice solutions for NATO, among other wins recently. The company’s BlackBerry Government Solutions business is positioning to serve the U.S. government, but management is also looking to provide service for other countries. Revenue growth is expected to pick up to a range between 23% to 27% in fiscal 2020, led by growth in BlackBerry Technology Solutions and the Internet of Things business. Analysts currently expect the company to report earnings per share of $0.17 for the current year, up from $0.14 last year.